Did you know that a new dementia case is reported at every 4 seconds? According to a report by the World Health Organization (WHO) and Alzheimer’s Disease International (ADI), the total number of people falling prey to dementia every year is around 7.7 million. Currently it has been estimated that 35.6 million people are suffering from dementia. If you or any of your near and dear ones are suffering from dementia, contact St Judes Nursing Home, a Dementia Home care in Surrey. It provides many benefits to people suffering from dementia. Dementia cannot be defined as a specific disease; it is a collection of many symptoms. Memory loss is a common symptom of dementia. People suffering from dementia generally belong to higher age bracket. They lose their ability to remember basic things. They become emotionally disturbed and need constant attention. It is not uncommon for a person suffering from dementia to experience personality changes and behavioral problems, like constant agitation and hallucinations. People with advanced dementia specifically need 24 hours a day supervision to prevent them from harming themselves. One way to ensure that they receive the care and treatment they need is to admit them to an elderly home care in Surrey, or to a dementia home care in Surrey. These home care facilities also provide assistance in daily activities, such as, bathing, eating, and dressing. At St Judes Nursing Home, dementia care is provided with utmost care and sympathy. Our motto is to provide compassion, support, and care, while ensuring safety. It is not uncommon to see behavioral change in a patient suffering from dementia and we focus on acute management of these conditions so that the patient can deal with this problem with as much ease as possible. There is a newsletter, Daily Sparkle for patients which provides information about events occurred on this day over the year which helps patients in remembering some facts from the past and give them a reason to smile. There is also an in-house salon; and an aroma therapist visits us weekly. Our residents are also given access to latest computer technologies through our Simply Unite IT system which also has Skype. There is provision for smoking rooms for residents who smoke. Our nursing home is registered with the care quality commission (CQC). Our highly professional team has been chosen by keeping in mind the personal needs of our residents. We believe that our team is a major reason behind our success. We provide nursing staff for any health related issue. We also have a Chef, kitchen assistants, housekeepers and a full time maintenance person. 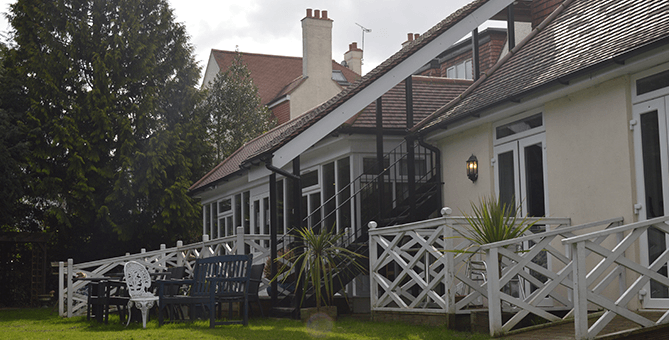 While there is a number of Dementia Home care in Surrey, we provide our residents an additional benefit by allowing them to live independently and with dignity.